Plastic with cushion grip (like plastic, and ergonomic). All knife handles are usable with Everhard heaters, except for the standard wood handle. A metal guard can be included between the blade and the handle. Plastic and cushion grip handles will not spread contamination inside your plant. More comfortable to use, and the cushion grip option provides a softer grip. 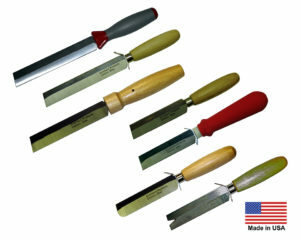 More heat resistant than wood handles and last longer when used with Everhard knife heaters.